The key aim of the project was to recomplete the original volume, and encompassed the repair and restoration of the parts that remained after the destruction of the Second World War. The original sequence of rooms was restored with new building sections that create continuity with the existing structure. 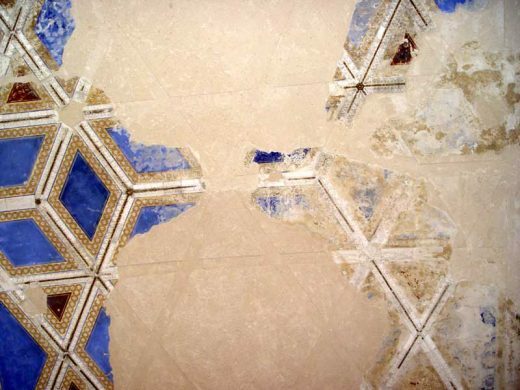 The archaeological restoration followed the guidelines of the Charter of Venice, respecting the historical structure in its different states of preservation. All the gaps in the existing structure were filled in without competing with the existing structure in terms of brightness and surface. The restoration and repair of the existing is driven by the idea that the original structure should be emphasized in its spatial context and original materiality – the new reflects the lost without imitating it. Other new volumes – the Northwest wing, with the Egyptian court and the Apollo risalit, the apse in the Greek courtyard, and the South Dome – are built of recycled handmade bricks, complementing the preserved sections. 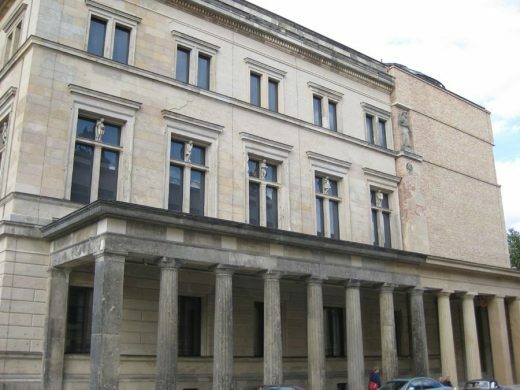 With the reinstatement and completion of the mostly preserved colonnade at the Eastern and Southern side of the Neues Museum, the pre-war urban situation is re-established to the East. A new building, the James Simon Gallery, will be constructed between the Neues Museum and the Spree, echoing the urban situation of the site pre-1938. 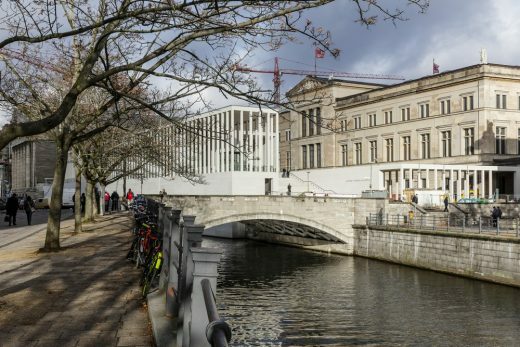 In October 2009, after more than 60 years in ruin, the Neues Museum will reopen to the public as the third restored building on Museum Island, exhibiting the collections of the Egyptian Museum and the Museum of Pre- and Early History. In the interim period, vitrines, pedestals and plinths designed by Michele de Lucchi will be installed. In October 2009, the Neues Museum in Berlin will open to the public for the first time since the Second World War. The main staircase hall was bombed out in 1943, and the South East dome and the North West wing were destroyed at the end of the war. Most of the surviving applied art subsequently suffered further deterioration by being exposed to the elements. 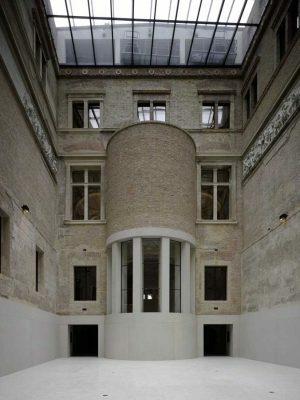 In 1997, David Chipperfield Architects, in collaboration with Julian Harrap Architects, was commissioned by the Staatliche Museen zu Berlin to turn the Neues Museum back into an active ‘museum for art treasures of international reputation’. 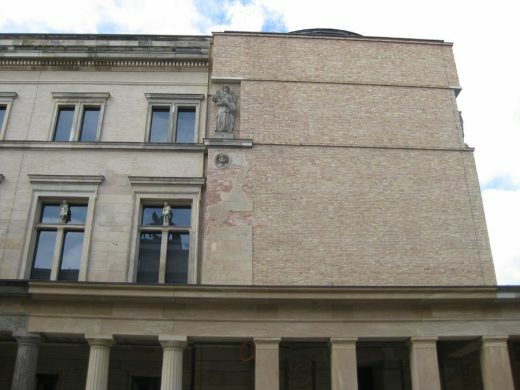 The brief called for the existing building fabric to be treated as ‘an architectural monument of the highest historical, artistic and scientific importance’. The focal point of the Neues Museum exhibition is not so much the delicate infill of the missing parts of the actual building, but the sophisticated unravelling of two dimensional layers as annotated in a series of ‘working drawings’. Dubbed ‘the coffee-stained drawings’, they have been updated on a daily basis, recording every move on site, inch by inch. They are not the work of a single genius but a palimpsest drawn by many hands. 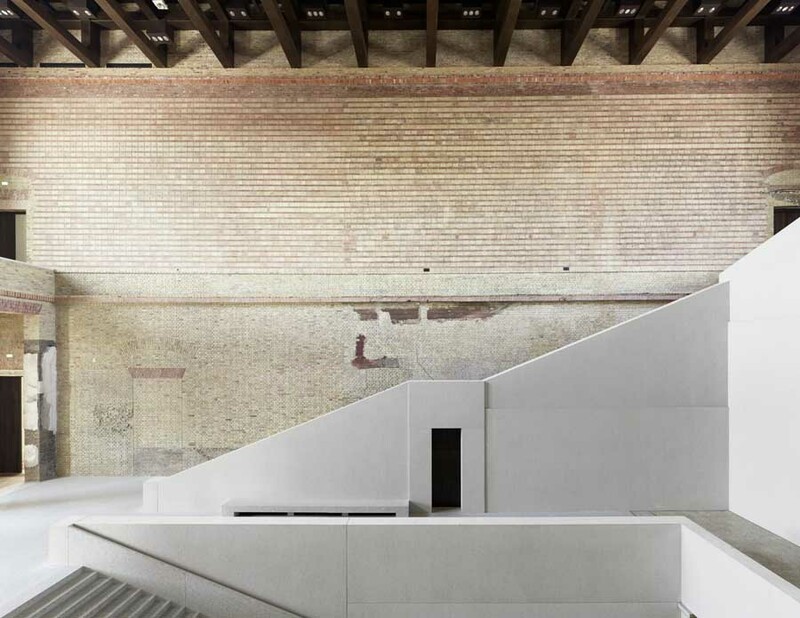 The process and the conceptual approach of the Neues Museum project have been described by many as ‘creative restoration’. It is clear that each decision is the result of an elaborate process involving designers, curators, historians, restorers and specialists. 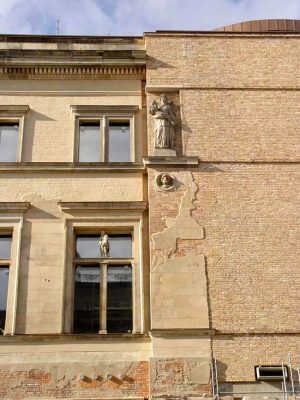 This bespoke preservation on a room-by-room or fragment-by-fragment basis is both daring and sensitive. The drawings testify to a profound renewal of the Neues Museum building creating a precise equilibrium between restoration, repair and intervention.